The Palestinian Prisoners’ Society (PPS) has reported that Israeli soldiers abducted, on Wednesday at dawn, eight Palestinians from their homes, in different parts of the occupied West Bank. 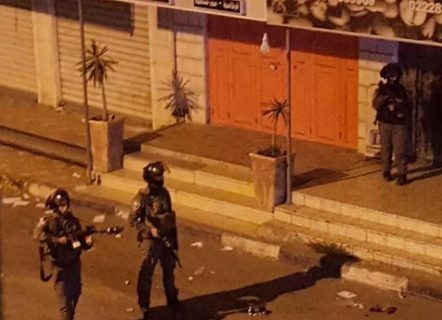 The Hebron office of the PPS, in the southern part of the West Bank, said the soldiers abducted Wahid Hamdi Abu Mariya, Mohammad Ibrahim Abu Mariya, and Yousef Bader Ekhlayyel. In Bethlehem, the soldiers abducted Mohammad Hatem Abu Ali, Mojahed Raja Abu al-Haija and Ahmad Abdul-Hadi Saffouri. Furthermore, the soldiers abducted Omar Mahmoud Mousa, 18, from Jayyous town, northeast of Qalqilia, and Mohammad Taleb Thiab, 48, from Tulkarem refugee camp, in Tulkarem, in northern West Bank. On Tuesday evening, the soldiers released three detained children, from occupied Jerusalem, and ordered them under house arrest for five days, in additional to imposing 1000 Shekels fine each. The three children are Mohammad Shweiki, Amir Nasrallah and Salah Abu ‘Assab.